A couple of weeks ago I decided I wanted to tackle bread making. I’ve been researching beginner baking books and ordered a few that should come this weekend. Last night, I had a serious case of cabin fever and was dreaming up plains of being becoming a master bread maker. I was flipping through Baking: From My Home to Yours by Dorie Greenspan and spotted a Cinnamon Swirl Bread recipe. I’ve made quite a number of the recipes from the book with great success so I decided to give the bread a shot. Baking bread is a long process. But I realized the process is just a series of steps that don’t involve a lot of hands on time. If you plan ahead making homemade bread can be quite easy. I sound like an expert after only making one loaf. I’m sure my tune will change once I get to baguettes and croissants. Below the recipe from Baking: From My Home to Yours. So yummy, warm, sweet, and heavenly. The base is similar to brioche. I choose to include the optional ingredients. The orange zest brings some brightness to the bread that I really enjoy. Have fun! To Make The Bread: Put the yeast in a small bowl, toss in the pinch of sugar and stir in ¼ cup of the warm milk. Let rest for 3 minutes, then stir—the yeast may not have dissolved completely and it may not have bubbled, but it should be soft. Working with a stand mixer, preferably fitted with a paddle attachment, combine the remaining 1 cup milk, butter and the remaining ¼ cup sugar and mix on low speed for a minute or two. Add the salt, egg, and vanilla, if you are using it, as well as the zest and nutmeg, if your using them, and mix for a minute. In all likelihood, the mixture will look unpleasantly curdly (it will look worse when you add the yeast). Add the yeast mixture and beat on medium-low speed for 1 minute more. Turn the mixer off and add 2 ¾ cups of the flour. Mix on low speed just until you work the flour into the liquids—you’ll have a sticky mix. If you’ve got a dough hook, switch to it now. Add another 1 cup of flour, increase the mixer speed to medium and beat the dough for a couple of minutes. If the dough does not come together and almost clean the sides of the bowl, add up to ¼ cup more flour, 1 tablespoon at a time. Keep the mixer at medium and knead the dough for about 3 minutes, or until it is smooth and has a lovely buttery sheen. The dough will be very soft, much to soft to knead by hand. Butter a larger bowl, turn the dough into the bowl and cover the bowl tightly with plastic wrap. Put the bowl in a warm place and let the dough rise until it is doubled in size, about 1 1/2 hours. 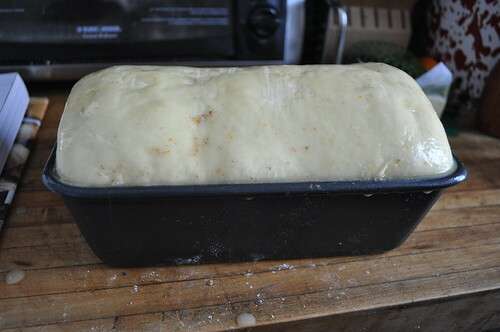 To Make The Swirl And Shape The Loaf: Butter a 9-x-5-inch loaf pan. 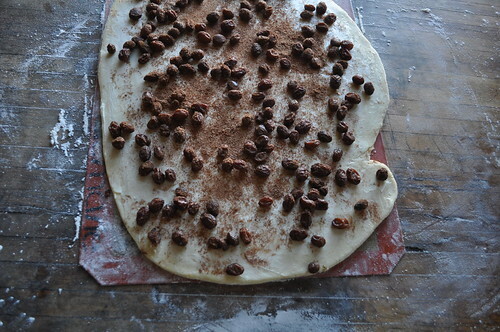 Whisk together the sugar, cinnamon, and cocoa, if your using it. 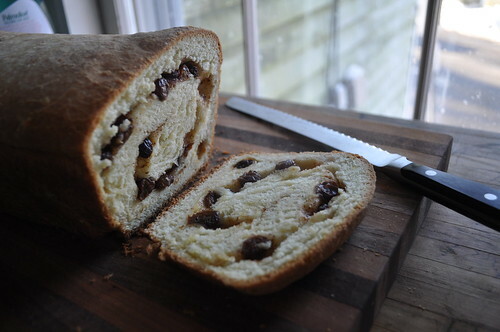 Check that the raisins are nice and moist; if they are not, steam them for a minute, then dry them well. Gently smear 2 tablespoons of the butter over the surface of the dough—this is the most easily done with your fingers. Sprinkle over the sugar mixture and scatter over the raisins. Starting from the short side of the dough, roll the dough up jellyroll fashion, making sure to roll the dough snugly. 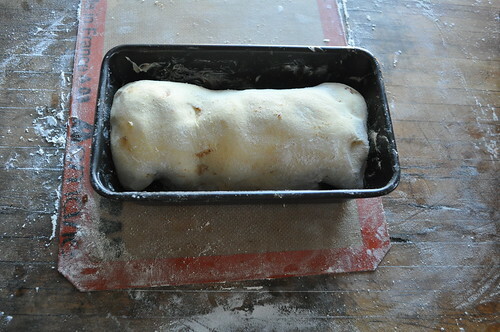 Fit the dough into the buttered pan, seam side down, and tuck the ends under the loaf. Cover the pan loosely with the wax paper and set in a warm place; let the dough rise until it comes just a little above the edge of the pan, about 45 minutes. Getting Ready To Bake: When the dough has almost fully risen, center a rack in the oven and preheat the oven to 375 degrees F. Line a baking sheet with parchment or a silicone mat. Melt the remaining butter, and brush the top of the loaf with the butter. Put the pan on the baking sheet and bake bread for 20 minutes. Cover loosely with a foil tent and bake for another 25 minutes or so, until the bread is golden and sounds hollow when the bottom of the pan is tapped. Transfer the pan to a rack and cool for 5 minutes, then unmold. Invert the bread and cool to room temperature right side up on the rack. Wonderful Leslie. Glad you had success. I love this recipe. The smell in the kitchen when it’s rising and baking is to die for. yesyesyesyesyesyes! My first successful double-rising yeast bread! I was starting to give up! Thank you so much for this recipe! My second rise didn’t rise as much as yours did in that picture but the bread came out perfect. A golden brown crust and beautiful swirl inside. I love that the bread is soft as well. I am going to try this as a white bread recipe next. so i’ve been in a little bit of a baking lull over the past several weeks and decided after church today to spend a little time reading animal vegetable miracle over a lovely cappuccino at my local starbucks. even though this book is INCREDIBLE i’ve been reading it ever so slowly and sporadically. 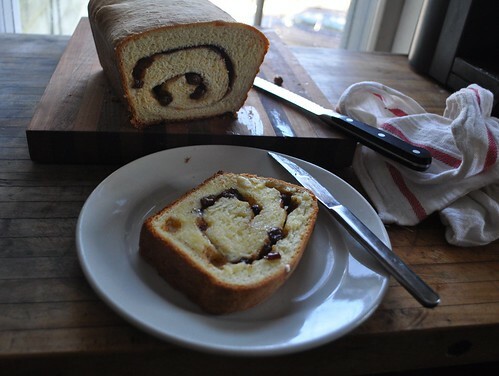 after reading a couple chapters i decided… this is the afternoon to try katy’s bread! low and behold… it’s just what i needed and so darn tasty might i add. thanks love! I made this recipe the other day, it’s delicious! Thanks for posting it. Oh, and I had to turn on a space heater in my kitchen, too! OM NOM NOM!!! that looks so yummy. something about buying a house must instinctively make us want to bake bread because i’ve been dying to start too! My husband and I have also been tackling bread in 2010! I think for us its more about tackling yeast! We will give your recipe a try. Thanks. Um, I’m making this today. Your bread looks great! This looks so, so good. Can’t wait to give your recipe a try! discovered your blog a couple of weeks ago. Love it! Your bread looks so delish…. I think you should perhaps leave your molding as is for a bit…I love that rustic look. reaching across cyberspace and taking a piece. I’m hungry! Your bread looks great! Katy, I am as always in awe of your gorgeous photos. I bake bread constantly, having worked as a pastry chef to support my painting. My first pastry mentor said to me “Remember, you control the dough. The dough does not control you.” It was great advice and serves me to this day. Bread is life. Enjoy. Your first loaf looks incredible. My favorite bread recipes by the way are from The Tassajara Cookbook, an oldie but goodie. Mmmmm! Dorie’s chocolate sablés (world peace cookies) are one of my standbys. I just finished making a grocery list including ingredients for gougères she helped a friend of mine develop (by suggesting that he freeze some, unbaked, to pop in the oven as desired – – a great thing to have, by the way, to go with a little impromptu glass of champagne). Your bread looks delicious! I’ll have to try it. Ha Martha! No kneading required you can use the dough hook on your mixer. I had to turn the space heater on full blast so that the bread would rise. I stripped down to just a bulky sweater and a scarf. I am picturing you with your hat and scarf on, kneading bread. You’re an inspiration…Keep the faith!